Swinging back to the NW at the storm. The entire Shelf is at an angle here. To the L it's further away, however to the R (out of frame) where it ends in the N, it's closer. Couple of sneaky c-gs hit down to the L where the denser rain is falling. Now I'm getting more than anxious. 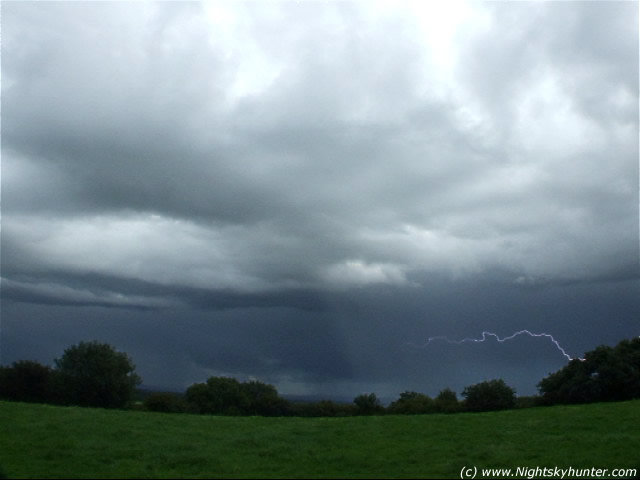 There's regular lightning from this storm and out of view to the L behind the trees is another storm moving in over Maghera. I'm now stuck between both. Looking directly N at the leading edge of storm one as it moves from L to R. Looking side-on at the Shelf Cloud/Gust Front. The entire dark area below is heavy rainfall. I try my best to get images which are faithful to the scene and match what the naked eye can see. This one is exposed perfectly and shows exactly what I saw at the time. More bolts going down in there. 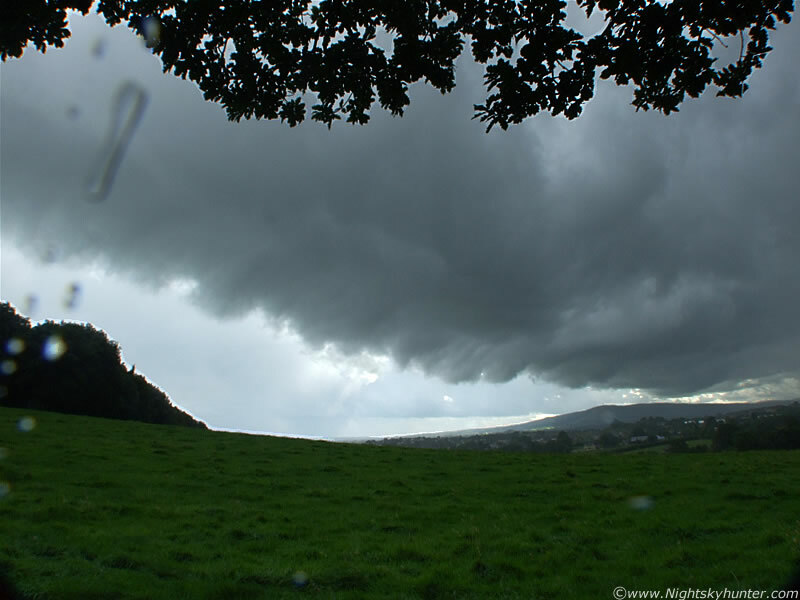 Camera tilted further to the R (NE) as I followed, what is now, a nasty thunderstorm at full maturity. Shelf looked very menacing at this stage. Amazing and terrifying blue c-g bolts struck the fields behind those trees. These where close!, literally at the end of this field near the bushes. Things were scary now, loud thunder from this guy and more from the other storm behind me out of view. I'm set-up under a line of trees (bad idea) but I had nowhere else to go. 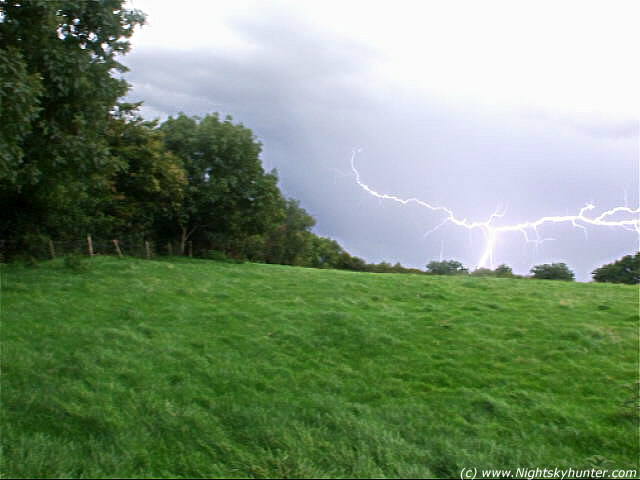 The camera was on a tripod so I backed about 10ft away and knelt down low to the grass and let the storm do its thing. I didn't want a metal tripod anywhere near me, there's a very good chance of a stray bolt hitting the thing, and I didn't want my hand touching it if that happened. The black dots on the image are flies which danced around the overhanging branches at the upper L. It was very warm despite all the rain. It must be the start of Autumn because a few leaves fell from the trees above me and fell over the camera. I could hear their creepy sound in greater number falling onto the floor of the dark forest behind me. I was taking constant images and regular video footage here hoping to catch one of those awesome c-gs, but they seemed to hit when the camera was not looking in that direction. There's a surreal sense of false security when doing this kind of photography. When I'm really concentrating on taking the images and watching the view through the LCD screen I feel like I'm no longer a part of the scene as if I'm watching the action detached from the outside. This is very dangerous because I'm under the illusion that I cannot get hurt. I'm sure many photographers have experienced this sensation. I woke up and gave myself a mental slap because I needed to be THINKING about my movements, location etc in relation to the storms. 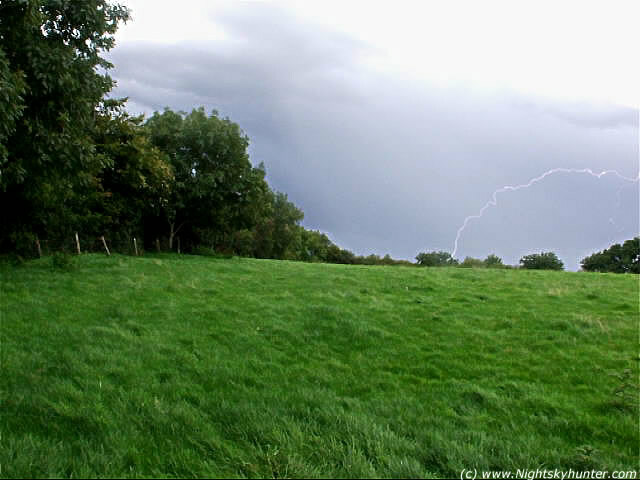 I left the camera on the tripod while it was taking video then walked down the field and into a clearing from the trees to check out the other storm which was smack bang on me. Wow!, this one was pure evil, it was now the dominant storm of the two so I ran back to the camera and carried it to a new location to watch this one. 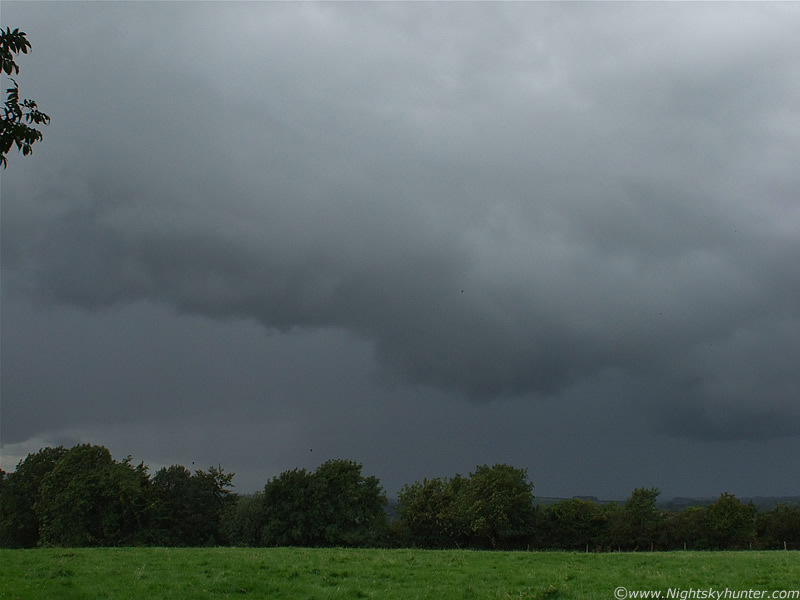 I'm now set up with camera on tripod in another field to observe what must have been the fourth or fifth storm of the day, and this was without doubt, the most violent of them all. I'm kneeling down under overhanging branches. 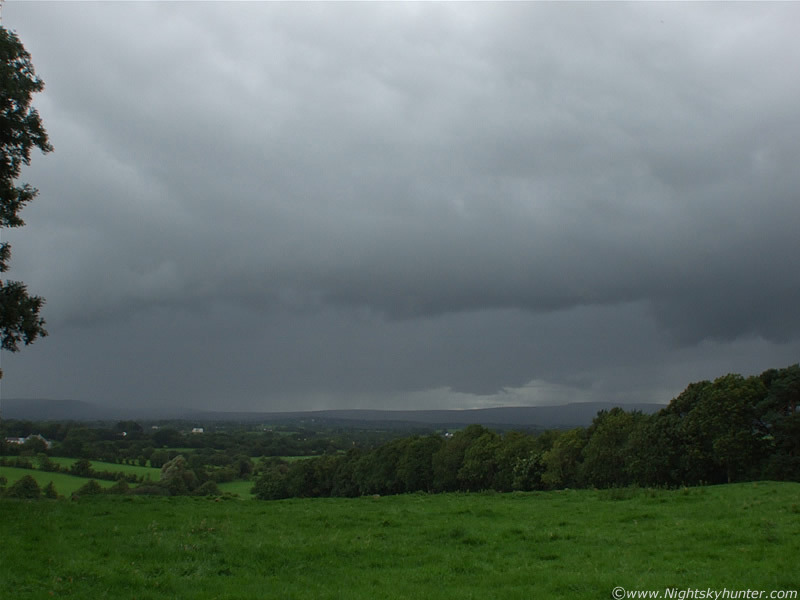 Looking S towards Slieve Gallion with the storm moving R to L. This is directly underneath a huge Shelf looking towards it's leading edge in the distance. Outflow rain is hitting the camera. The more intense precip core is to the R, out of frame, where most of the lightning is. The previous storm is still very active to my L as it moves E so I'm still between two very active storms. Things are going mental now. This was one of those times when I think to myself 'what am I doing here? ', I'm exposed on high ground under bad storms yet again and I could really feel, even taste, the very potent sensation of danger and fear. The lightning was deadly and the thunder was really something else. I was trying my best to take images and a few video clips but the intense rain was hitting my camera hard. The last time this happened it stopped working and took several days drying to get a response again. The red battery light flashed on the screen then the camera went dead so I had to remove the batteries, fish around in the pockets of my carrying case for the spare set, then put them in the camera, all while this storm raged. I got it sorted but missed some great captures in the process. Good job I had spares though. I gave the lens a good clean while I was at it. 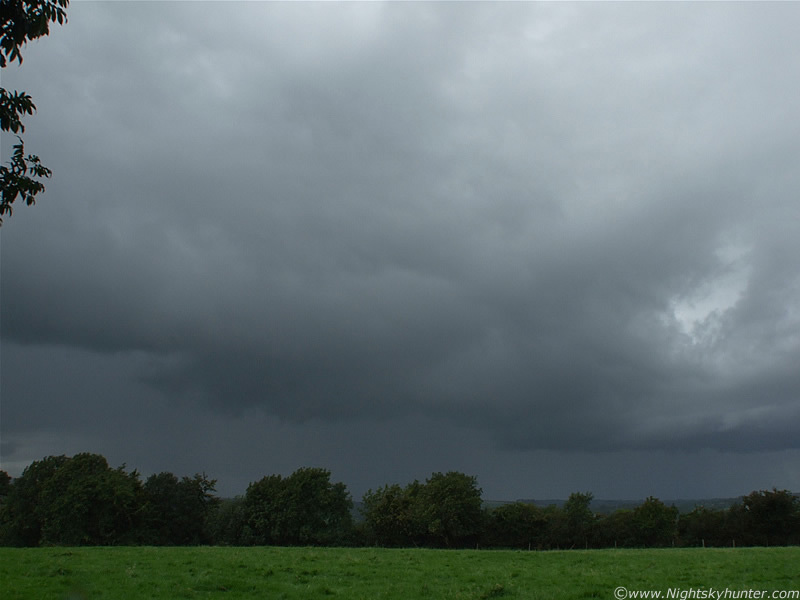 Things went silent for a period and I began to relax just as the main precip core passed near me behind the Shelf. That comforting feeling was cut like a knife through butter when an incredible c-g exploded straight in front of me, ''holy s**t!!!' I said at the time, then the most terrifying thunder followed which scared the hell out of me. It was like an incredibly loud gunshot crack of long duration which almost could be felt. It was unbelievable!!!. It showed how close that strike was to me. Now I was genuinely scared for my safety. More lightning like this continued. I text a friend to let him know the situation and he told me to get out of there and indoors but I was frozen like a Rabbit caught in headlights. I decided to stick it out to the end because despite the fear I was really enjoying it at the same time. You can hear that loud crack of thunder on the video clip but you need to turn your volume up loud. It doesn't even come close to what it really sounded like. I realized that in the middle of it all I had lost my lens cap so I wasted time looking over my long wet tracks through the grass in search of it then gave up and began taking more video. The above is a still from that video showing another I-c bolt. The lightning was very dangerous at this stage. I text my friend (John McConnell) and informed him that a dangerous storm was heading his way and to keep his camera handy. He reported some good cells and mammatus from his location further E. The bolts not only looked impressive but seemed to come from the pits of hell itself. The bolts would shoot down in pairs or triplets as rapid as the blink of an eye. Their unpredictable nature was what had me worried because they would drop down from random wide spread locations and twist and bend through the air in wide arcs. I didn't know if they would hit the ground, the air, or me. My heart was racing I can tell you. Looking E into the rear of the retreating storm. Two I-c bolts snapped out. I think this is my best lightning capture to date. 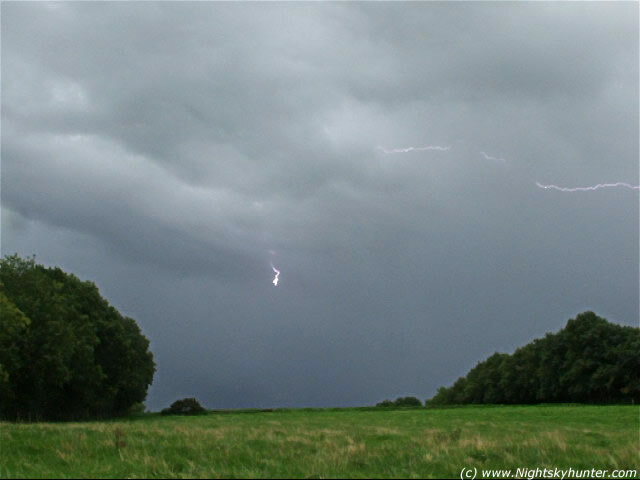 Two types of lightning visible at the same time all within a fraction of a sec. The horizontal bolt is an I-C which came out of the rear of the precip area to the L and shot across the sky to the R with multiple branches. The other is a classic curved C-G going down below the hedge over the brow of the hill at very close range!. Possibly a third C-G to the L of the main one, much thinner. I was holding the tripod in one hand with camera mounted on top taking AVI and at the same time walking up the hill towards the storm thinking the worst was over until this happened. I was caught mid-walk which is why the trees are bit blurred. This is wide angle so it was much closer than it seems. When I look at this image now I really do wonder if someone was watching over me because that area where the bolts hit was the exact location I was standing in all day doing photography. I only moved to lower ground about 15 min's before this. I wonder if I would be writing this now had I stayed. That decision to move location to look at the S storm was a good one! Curvy c-g. Pity the beginning of it is out of frame to the R. Bolts where shooting out from the R and L at random times so it was surprisingly difficult to catch one. Now standing at the top of the hill where that bad c-g hit down looking into the rear of the retreating storm. Note the rear of the Shelf to the bottom L in the distance above the trees. The precip curtain to the centre and the closer one to the R near the frame is where the lightning continued, so they where still close. Yet another c-g. 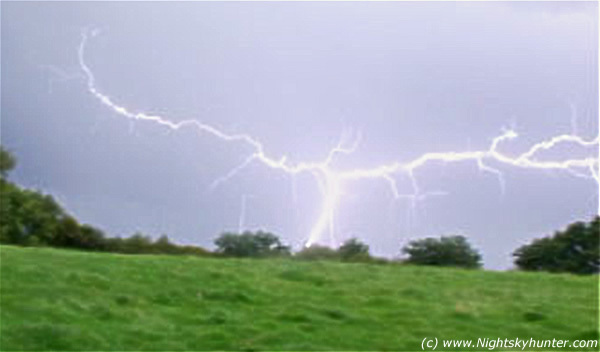 I managed to catch seven bolts on camera but these are the best. 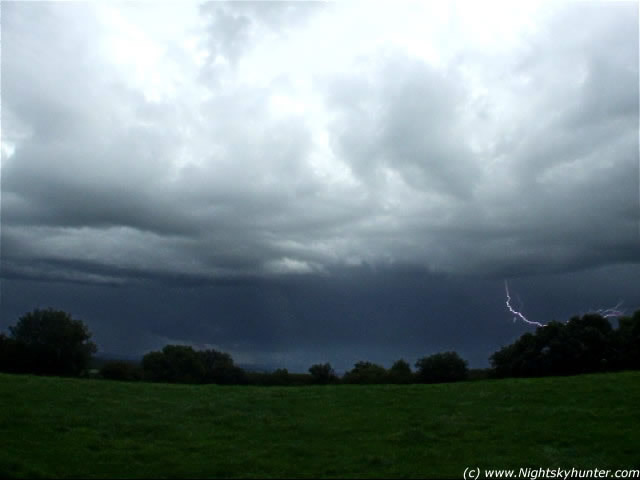 This was my favourite time because the storm was retreating a good bit now so all I had to do was set the video running and catch loads of lightning. That was the plan until I noticed I had filled my 2 GB memory card, that's a first. I had to put in a spare 128MB card but by then the tree line was blocking the bolts so I had to walk through a dense forest to find a good view point on the E horizon. 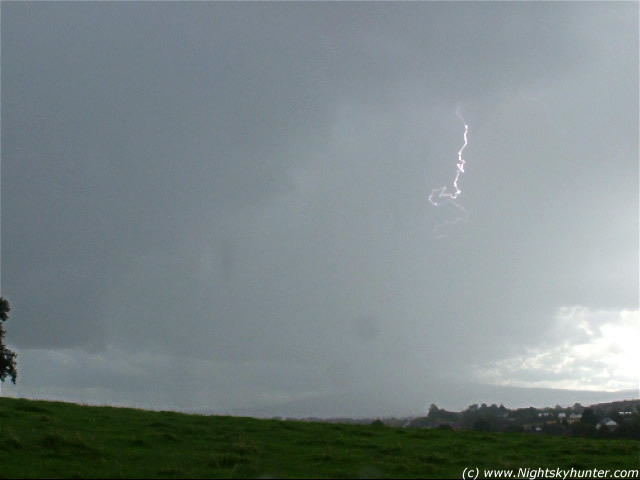 I took some video but the bolts were getting less frequent and more distant so I ended the photo session. A nice section of rainbow arched across the back of the storm and behind a group of tall trees which looked very dramatic. I felt like I could have touched it, it was that close. The sky turned blue in the W trees, the Sun was back out and the storm was over. It was now 16.00 BST. I watched a beautiful line of convection to my S with incredible towers like bombs and kept an eye out for funnel clouds from their bases before finally heading home 30 min's later. It was a successful day! Youtube video footage showing various scenes throughout the day, convection, anvils, Shelf Cloud, and some of the lightning and thunder towards the end. You will have to be quick to catch the bolts. The compression kills their true form though. This is only + 6 min's out of 25 min's of footage I took. Back home I was on a high after such an exciting day. I think I'm going to be doing this kind of photography for the rest of my life...I love it!. 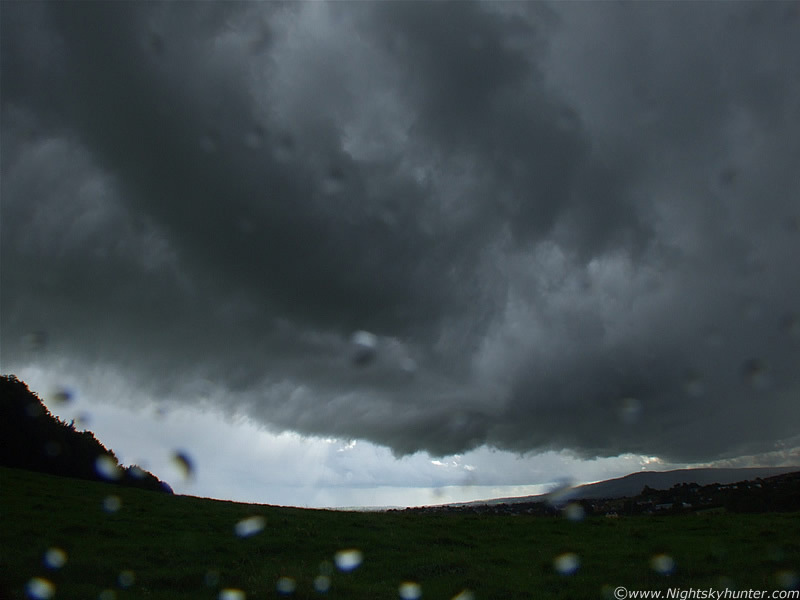 The bad weather is set to continue so I will be trying my best to catch a few more storms. Thanks for reading.